An NAACP Image Award for IN THE NIGHT OF THE HEAT---and a complete list of winners!!! CAPTION: (left to right) Blair Underwood, Tananarive Due and Steven Barnes on the red carpet at the 40th NAACP Image Awards. Photo credit: WireImage.com. The other nominees in the category were my friend E. Lynn Harris for Just Too Good to be True, Bonnie Glover for Going Down South and James McBride for Song Yet Sung. Formidable competition, to say the least. So I didn’t expect to win—especially since the blessing of a double nomination meant that I was likely to split my voters. I’ve only been nominated for an Image Award once before—for The Black Rose in 2001. I didn’t win. It was an amazing experience, and an eye-opening one: Since that night, I’ve watched the Oscars with much more empathy for the nominees who ALMOST got to take the statuette home. For almost a week, I was a ball of nerves. It took so much energy for me to prepare for the ceremony and the receptions and parties, I ended up writing notes for my acceptance speech in the car on the way. Even then, it felt like a foolish jinx to write anything at all. Even split in half instead of thirds, that left only 22 seconds apiece for an acceptance speech. And then there was the surreal element. When the name of our book was called, almost all rational thought fled my mind. I don’t remember the walk to the stage at all. All I know is that I ended up at the microphone first. I remember thanking my parents. I thanked Steve (“my collaborator and soul-mate.”) And I thanked Blair (“for his vision and a wonderful character in Tennyson Hardwick.”) And my editor, Malaika Adero at Atria Books. In retrospect, it seems as if I was just rattling off names. “I stand here today on the 100th birthday of National Association for the Advancement of Colored People, less than a month after the inauguration of the nation’s first black president, and I am humbled to receive this award. First, I want to thank my parents, John Due and Patricia Stephens Due, who raised me and my sisters Johnita and Lydia to know our history—and to believe that an individual CAN change the world. For me, this is a homecoming. We were raised at NAACP meetings, attending NAACP conventions and demonstrations, and I was tested and trained as a young writer in the NAACP’s high school ACT-SO competition, founded by the late Vernon Jarrett. I also want to give a special thank-you to the NAACP for being the only major Hollywood award that includes a Literary category! Thank you for recognizing that authors of fiction, non-fiction and poetry deserve a place at the Welcome Table, too. I want to thank my collaborator and soul-mate Steven Barnes, an extraordinary teacher who has always given me room to fly. We have distinct voices in our solo work, but our collaborations have brought us new and surprising harmonies. And thanks to Blair Underwood, who has taught us through example how to maintain grace and dignity in this battleground called Hollywood. We conceived of the Tennyson Hardwick novels as a way to tell stories of healing and redemption that matter to all of us—while at the same time hoping to empower ourselves to have more control over how characters of color are portrayed on the screen. We hope we are walking in the right direction. Even that doesn’t sum it all up, but it’s closer. The Image Awards included memorable performances by Jennifer Hudson, Stevie Wonder, Beyonce and will.i.am, along with a tribute to Nobel prize-winners Al Gore and Kenyan environmental activist Wangari Maathai. I was happy to have the chance to be in that room and shout the Champ’s name. After we received our award, Blair ushered us out of the auditorium to walk the red carpet. Since red carpets are not a part of a writer’s normal life, we were happy for him to lead the way. Next, the red carpet, where a bank of about 40 photographers awaited. We stopped to pose at three spots along the carpet, and all the while the photographers tried to direct our gazes: “Blair, look up!” “Look left!” “Look right!” Flashbulbs strobed around us. Other arrivals were posed behind us, and there were disgusted cries from the photographers when a publicist just behind Steve wouldn’t get out of the way of the shot. Other arrivals that day included Halle Berry, Sean Combs, Dakota Fanning and a gaggle of other celebrities, so Blair made sure to explain who we were: “Image Award winners!” he said, and spelled our names out for them. When the cameras from “Access Hollywood” and “Entertainment Tonight” found Blair, he made sure we were included. Not exactly a typical day in a writer’s life. After the Image Awards, at one point we were standing fewer than five feet from Will Smith backstage, although we didn’t have a chance to speak to him—or his wife Jada Pinkett-Smith, who was with him. 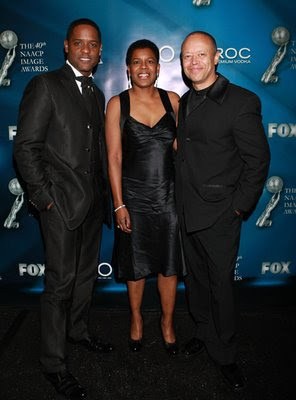 At the after-party, Steve and I shared a table with actress CCH Pounder (“The Shield”) and actor Jeffrey Wright. I also stopped at NAACP chairman Julian Bond’s table to give him greetings from my parents, who know him as civil rights activists. All in all, it was an unforgettable night. Here is the complete list of 2009 NAACP Image Award winners. Congratulations to all of the winners and Image Award nominees!